I’m going to England in three weeks, and I’m terribly excited. I’ve definitely got Britain on the brain. Since I’m also prone to thinking about food, I started to think about British food. And let me tell you, they sure have us beat when it comes to naming their dishes. Bubble and Squeak? Come on, that’s brilliant. This recipe comes straight from the BBC, except I veganized it and added a little something. Bubble and squeak doesn’t need to come in cake form, but when given the choice, I can’t see myself ever not wanting to make it this way. I mean, look at the adorable little cakes, full of squeaky goodness! 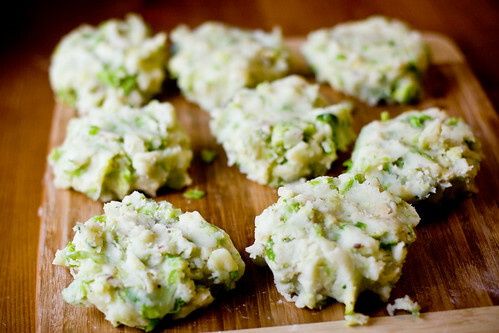 So, bubble and squeak, for those who aren’t familiar, is an English dish developed to use up your leftover veggies. The veggies are usually mashed potatoes and cabbage, fried up. Since the dish is designed for leftovers, pretty much anything goes. Carrots, brussels sprouts, seitan, tofu, squash, kale, collards; I imagine you could put anything you want in these, especially if you chop it up pretty small beforehand. This version is simple: potatoes and brussels sprouts. If you’re unfamiliar with brussels sprouts (one of my all time favorite vegetables, believe it or not), go ahead and read this little sprout primer I wrote before shopping for them. I think the potato is one of the best Leafy Green Delivery Systems around. If you’ve been meaning to eat more greens but haven’t figure out a way to do it, cook ‘em up, chop ‘em up, and add them to mashed potatoes. You will not be sorry. 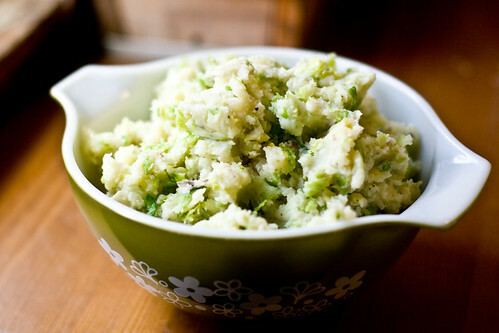 Give colcannon a shot, or try out this recipe for bubble and squeak. I added Old Bay seasoning to these instead of plain salt, but you can use either one, or your favorite spice. Bring a large pot of well-salted water to a boil. 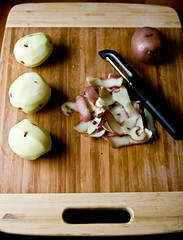 Peel and chop potatoes into bite sized pieces. Smaller red potatoes need only be quartered. Add potatoes and boil for 12-15 minutes or until tender. Meanwhile, chop the ends off the brussels sprouts and remove any bad looking leaves. When there is five minutes left of the potatoes, add the sprouts and cook for four minutes. After four minutes, remove them with a slotted spoon to a bowl filled with ice water to stop the cooking. Drain the potatoes and return back to the hot (empty) pot you boiled them in. Turn the heat down to low and let the potatoes dry for 1-2 minutes. While the potatoes are drying out, drain the sprouts and pat them dry. Shred them finely with a chef’s knife. Add the Earth Balance to the potatoes and mash well. Mix in the sprouts and 1/4 tsp Old Bay seasoning (or salt) and taste for flavor, adding more seasoning if desired. Set aside until cool enough to handle. Mix the 1/2 cup flour with 1/2 tsp Old Bay (or salt). Heat a large, cast-iron skillet over medium heat with 1/4″ oil in the bottom. Break up the potato mixture into 8 rough patties. Gently form each one into a smooth, hockey puck like shape. Dip the cake in the seasoned flour mixture. Be gentle, and do this for each patty. Fry 3-4 patties at a time for 2-3 minutes a side, until golden brown. 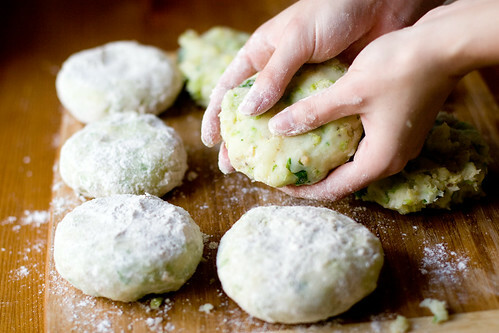 You may need to re-dip them in flour right before putting them in the oil, so keep it handy. Use two spatulas (or a spatula and a flat wooden spoon) to turn the cakes; you don’t want to splash hot oil all over yourself. Place fried cakes on a baking sheet with parchment paper. Once all the cakes are fried, you can place the whole sheet of them in the oven for 15 minutes to re-heat and re-crisp them in time for your meal. You can also refrigerate them for up to three days (reheating in the same manner), or freeze them for a month. I served mine with some lingonberry preserves (that I bought at Ikea. Shhh! ), but cranberry sauce or your favorite gravy will go very nicely. September 18, 2008 - 8:33 pm A.
AAH! I made these tonight, but used squash vines instead of sprouts. I sauteed the leaves with budda and garlic and added them to the mashed potatoes, and use a little nutritional yeast in the flour since I didn’t have Old Bay. This is my favorite cooking blog, and where I get the majority of my new recipes from. Thank you!!! They’re totally delicious by the way. I’m eating them southern with some spicy mustard. That’s great that you’re coming to England! A perfect recipe to highlight our local Alaskan ingredients right now! What fun! I’m a bit too lazy to make the cute little “cakes” version, but this post (and the beautiful photos) inspired me to invent my own take on this recipe! Bubble & Squeak, Deconstructed. I made garlic-roasted potatoes to eat alongside savory sauteed cabbage & onion with dill (with optional mushrooms). Yummy! Thanks for the inspiration. Check out my version + photo on my new blog, if you’d like! Cheers, and thanks for the great idea! Have a great trip, and come back with lots of new recipes! I love this recipe! Thank you for posting it. 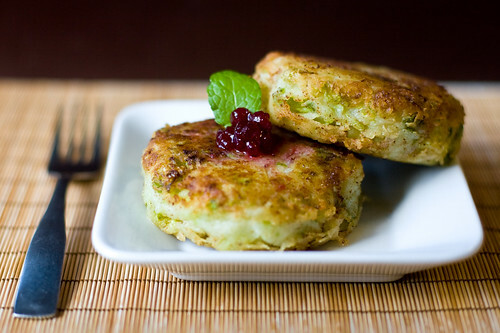 I’m reviewing your bubble and squeak recipe on my blog, but giving you props. LOVE your blog! every single thing has been delicious. and i hope you enjoy England… shockingly, we’re having a bit of sunshine at the moment! 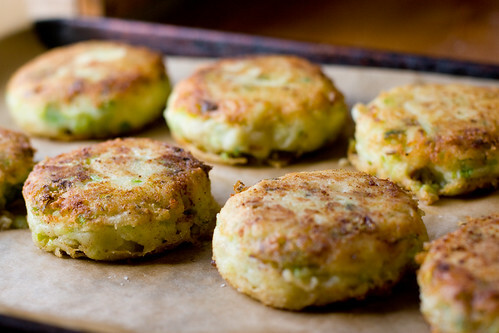 I’m from the UK and I love bubble and squeak, but only seem to have it around Christmas time and I don’t know why!! We love your photography by the way, we’re a big fan of large high-quality food images as you might be able to tell by our website! September 24, 2008 - 12:14 pm Rachelle ~ "Mommy? I'm Hungry!" These look amazing, I’ll definitley have to give this recipe a go! Yum! I wonder what it would taste like if you added sweet potatoes instead of red ones. Have fun in England! Just made these tonight. I used shredded cabbage instead of sprouts but it was excellent. Very much like hash browns, but ten times better. I paired it with super simple onion gravy — just flour, salt, and broth. Holy crap, it was so good. I used your recipe this weekend but substituted kale for Brussels sprouts, because we had kale that would otherwise be wasted. It worked very well. My cakes didn’t look as pretty as yours, but they sure were delicious. Thanks! January 27, 2009 - 7:09 pm Pingback: Cheerie-o and Pip Pip « …but what does she eat? these are magnificent! my family loved them and i froze a few to eat as leftovers. this is the only way i’ve been able to stomach brussel sprouts (i’m trying to love them, really!)! I made this tonight and loved them! Thanks for the recipe and the iphone app! I’m making these tonight and cannot wait. I haven’t had bubble and squeak in years. Thanks for sharing this. I’ll let you know how they come out. thanks so much for this recipe. I tried doing bubble and squeak quite a few months ago, thought it would be easy as pie – just boil and mash the veg, but the mixture was sloppy and they turned out horrible. I wanted to try them again, as I think my kids will love them but have been too scared! I just found your recipe, and am so glad I did!! Now I know what to do and hopefully my mixture won’t be sloppy! I am going to get that Iphone app now too!! Thanks again!! yay! the first recipe i made off this blog and so good! Made it tonight, had it with Stonewall Kitchen’s Pomegranate Grille Sauce and was excellent!